Annie is from Madison, but is currently attending Carroll University in Waukesha, WI. She is currently pursuing a degree in Animal Behavior and Psychology. As you can imagine, all the college students are thrilled to have a cute puppy on campus. When not at school or doing homework, Annie enjoys hiking, riding horses and running agility with her dog Roo. Why WAGS? When I was 9 years old, I read a story about a guide dog and his handler. 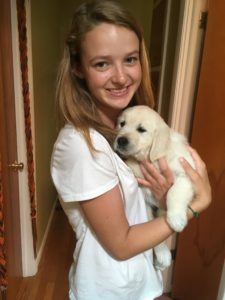 From then on I wanted to raise a puppy to be a service dog. I kept this dream in the back of my mind until my freshman year of college. 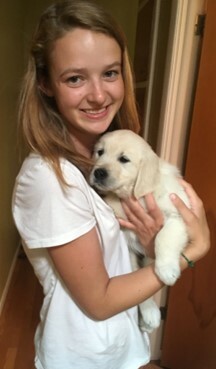 I learned about the internship requirement for my major, and decided that training a puppy could be a good fit. I tried to find an organization that matched my own values and would teach me about training the dogs. About a year later I contacted WAGS about being a puppy trainer, and somehow everything worked out. I’m so glad I was able to find WAGS and become a puppy raiser.